I’ve got so much going on right now to show you all in good time, like some new tutorials, site features, and more, but in the meantime let’s have a look at the latest Manequim magazine. The downside is that they removed the little tech drawings next to the fashion photoshoots so not only do I now have to keep flipping back and forth to the instructions at the back to see the pattern lines (extra annoying since they’re not in numerical order in the magazine) but I’ve also got to do extra image editing work to show you the tech drawings, dear readers! In the soap star style section, this little black dress and chiffon blouse both caught my eye. The dress in particular looks like something I’d totally wear! This men’s yoked & lined jacket looks really nice! 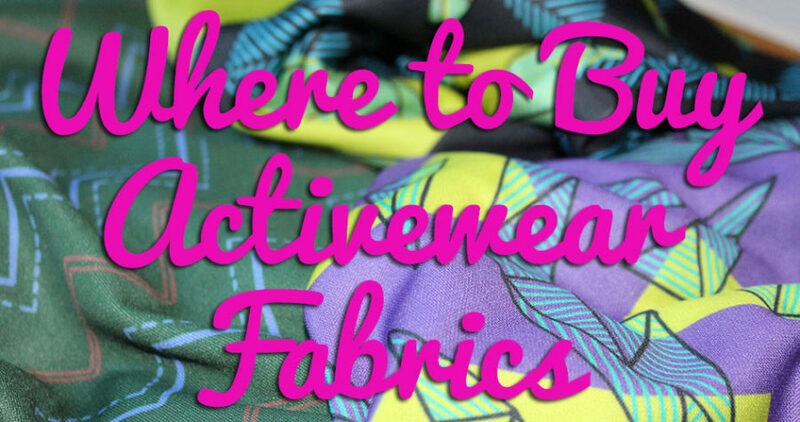 They say the pattern is online, though but I don’t see it in the list of free patterns (totally worth checking out though anyway!)? Can anyone find it on the site? 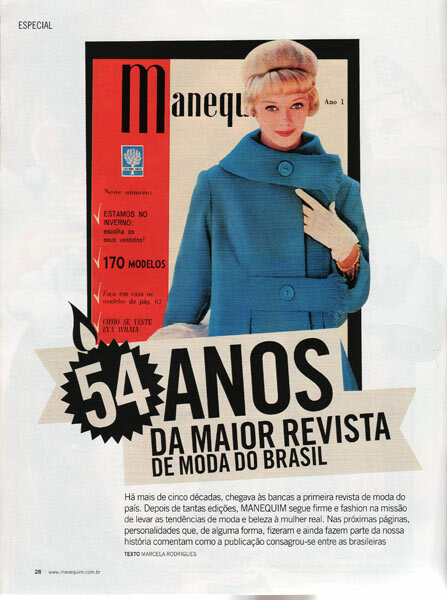 This issue apparently apparently celebrates Manequim’s 54 years as “the best fashion magazine in Brazil”. Seems an arbitrary number of years for a celebration, but no matter. I like seeing the original first issue cover, but I’d have liked it more had they given us some vintage reprint patterns! This dress was just too big a look to pass up – you know that saying to “wear your clothes, not let your clothes wear you”? Well I’m pretty sure those sleeves are actually eating her alive omg run away, lady!! 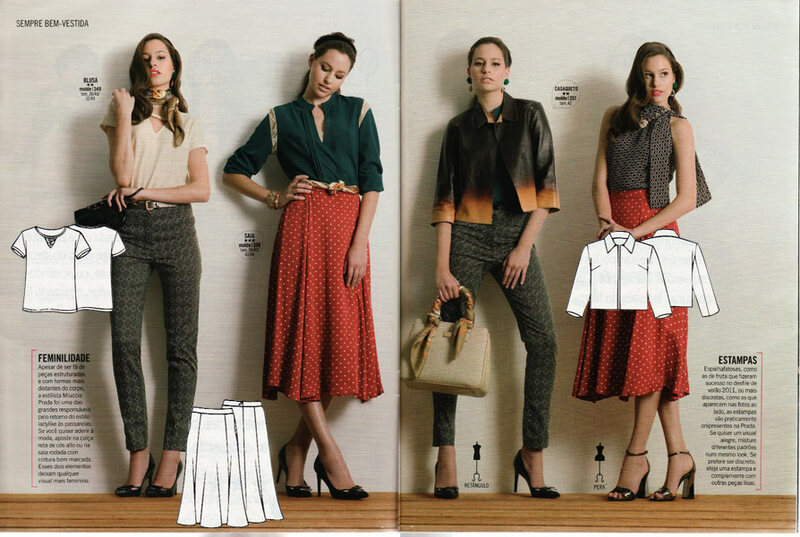 Hurrah for a very wearable collection of patterns inspired by Prada this month! We get patterns for a teeshirt with front cutout (very easy to do yourself with any teeshirt pattern, too! ), midi skirt, and cropped jacket. Also included is a dress that looks like separates, partially shown under another skirt on the far right. How gorgeous is this dress with the illusion neckline? I love pretty much everything about it – the colour, the 1950s silhouette, the hem interest… Wonderful! From the same feature, I really like this dress with the pleated inserts above the bust. It kinda reminds me of one of Gertie’s designs, but with a more modest neckline. Are we sick of peplums yet? I’m not sure I am – I rather like this dress with its 1940s feel, especially since it’s got a bit of a different twist on the peplum by incorporating some wrap ties in. 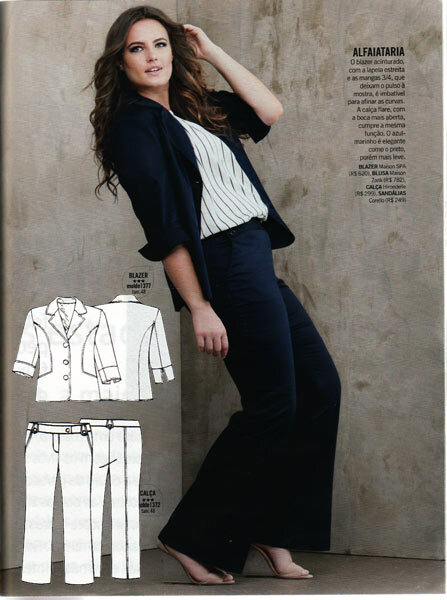 There’s an expanded Plus section in this issue with a lot of very wearable shapes, including this rather nice trouser suit, which I reckon could be paired very nicely with the silk blouse on the next page. 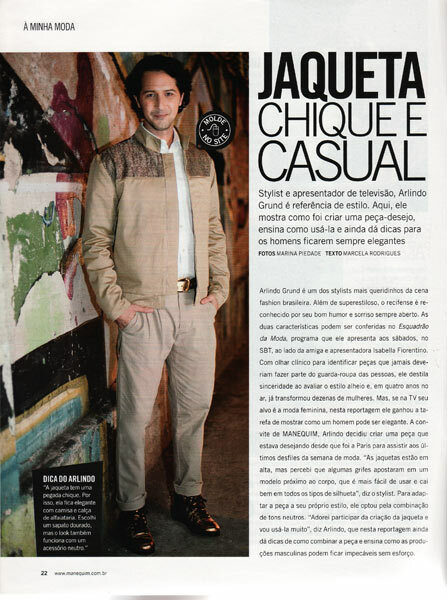 You know how big a fan I am of Manequim’s silk blouses!! All of you who have read down this far will be pleased to hear that I’m renewing my subscription for another year, too! 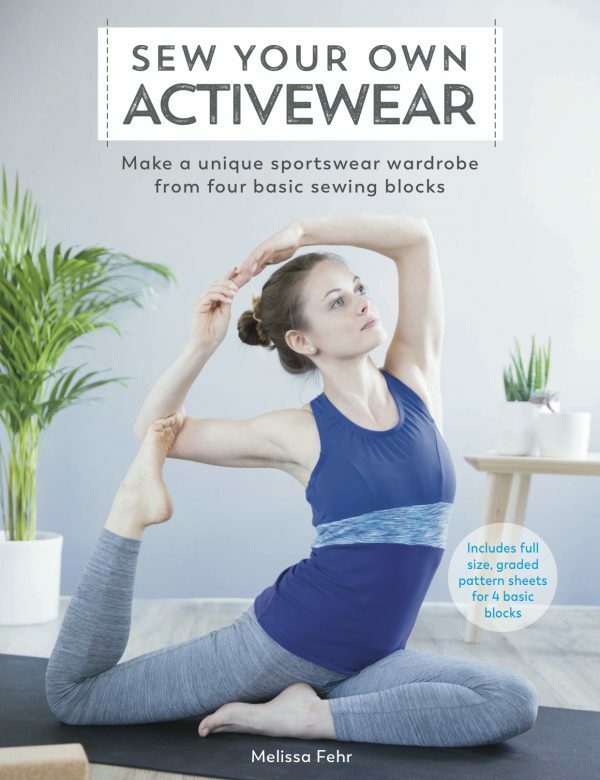 At $80US per year (including postage to the UK), it’s about half the cost of my Burda subscription, and even if I only make a few things, the inspiration is totally worth it to me, and I hope to you, too! 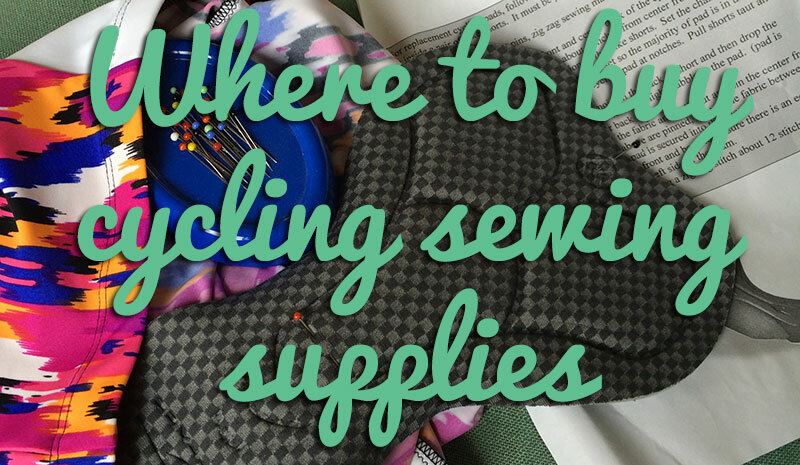 I talked about the subscription process here if you’re interested (though I really can’t help if you’re having issues – I don’t work for Manequim! ).